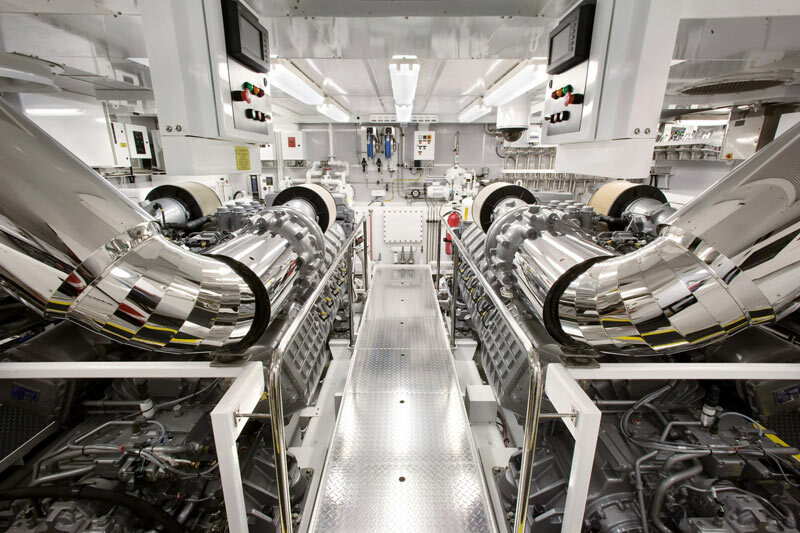 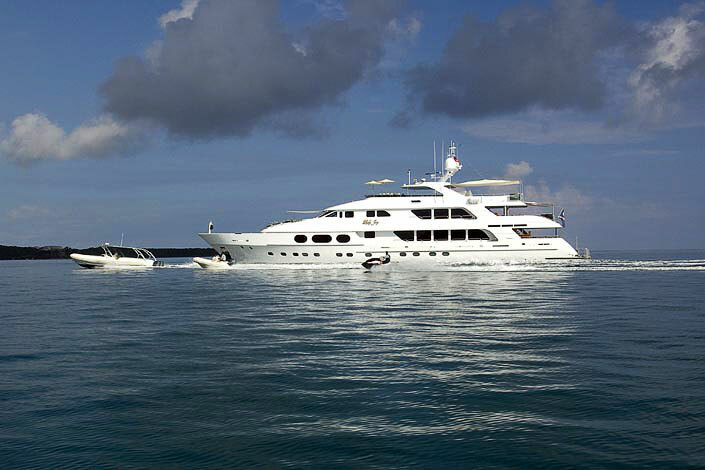 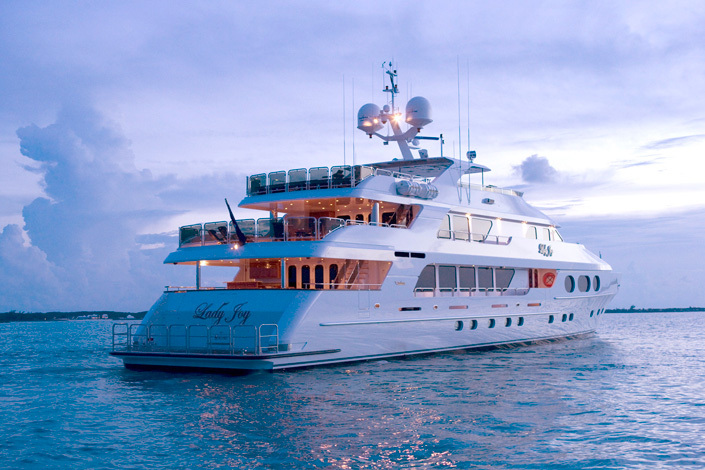 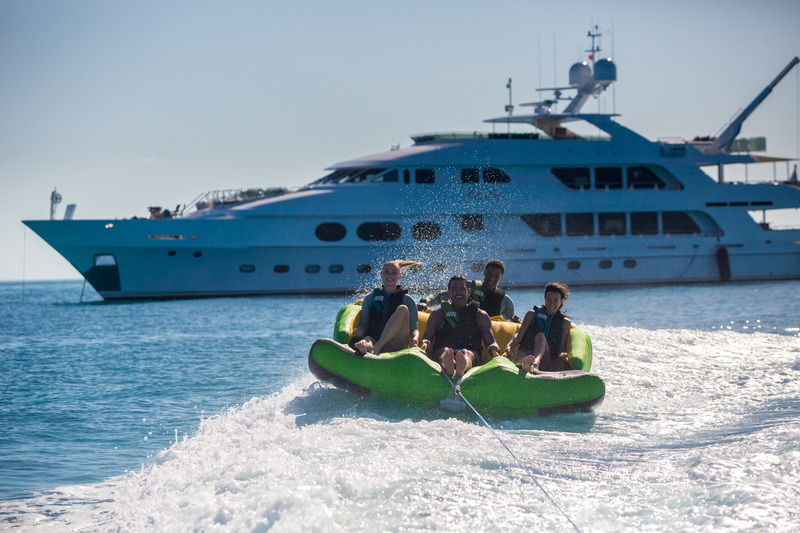 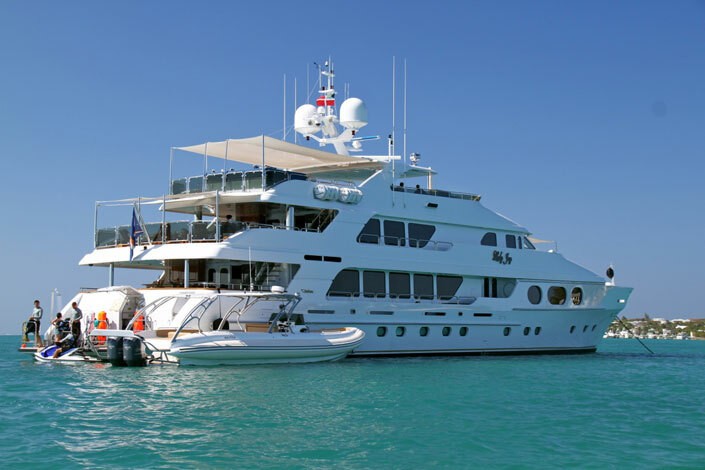 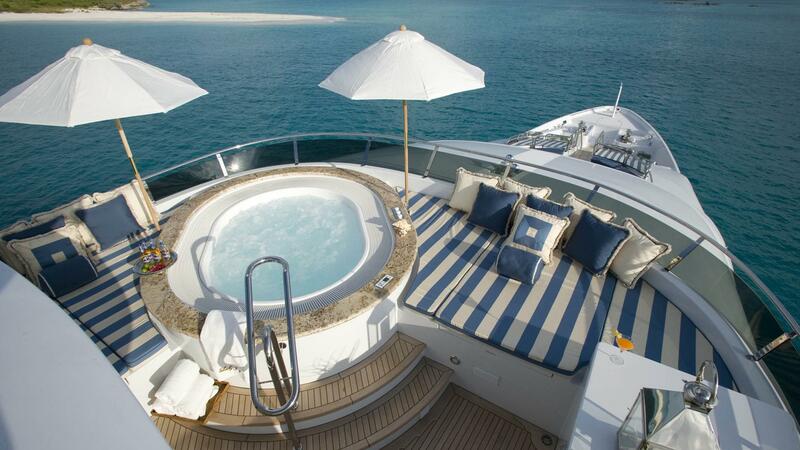 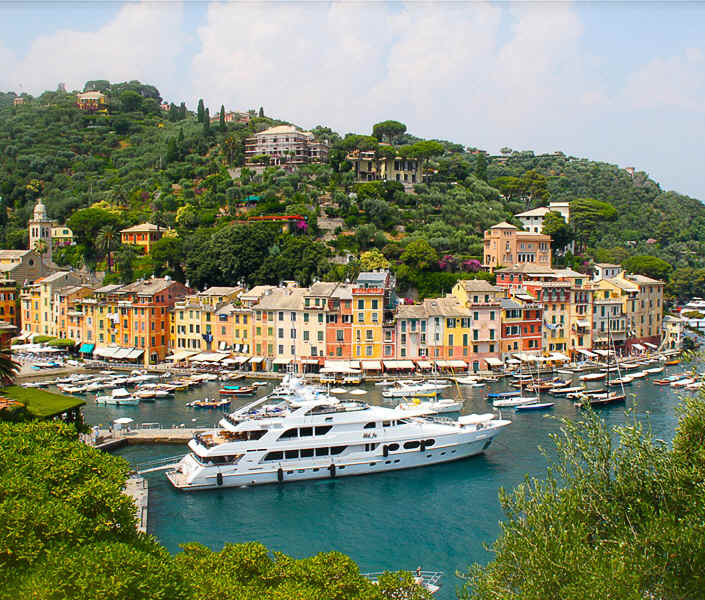 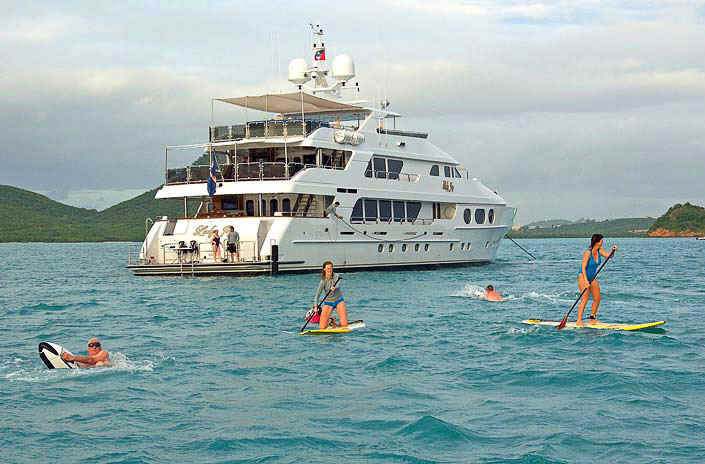 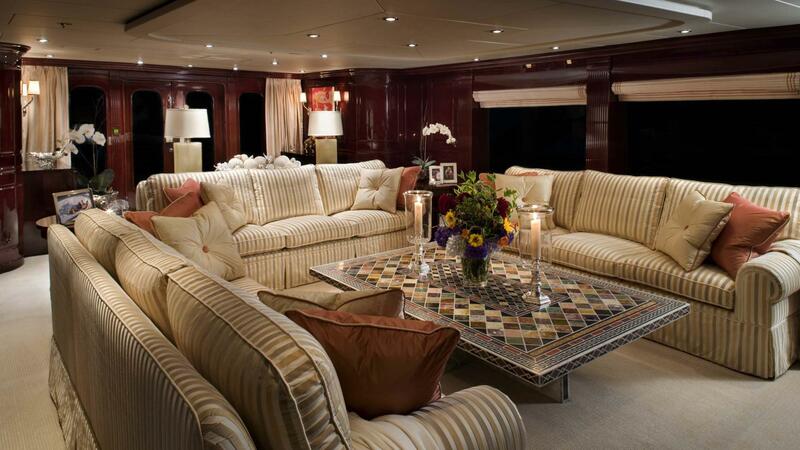 Luxury motor yacht Lady Joy was launched in 2007 and offers contemporary and elegant accommodation for 12 guests. 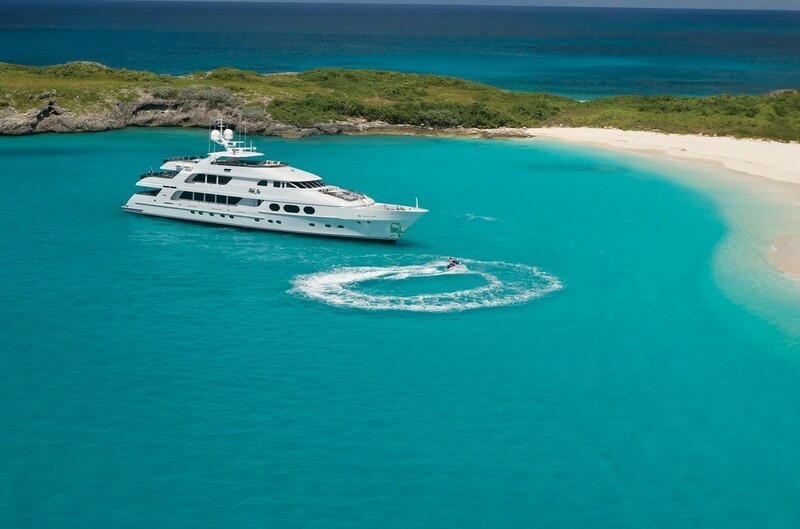 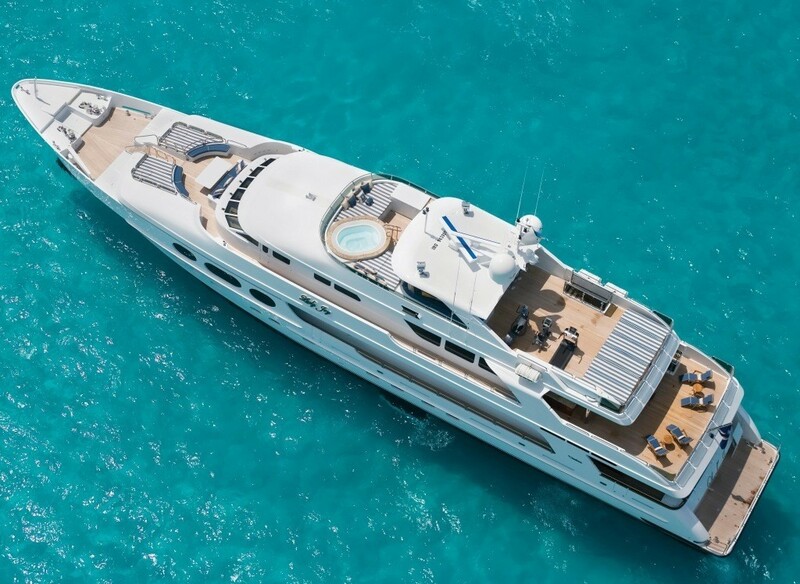 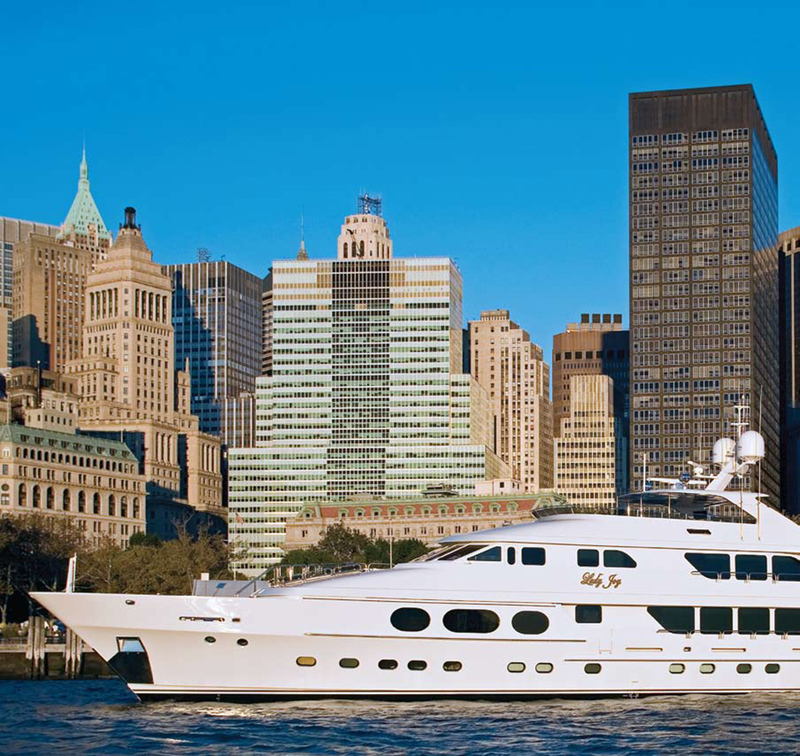 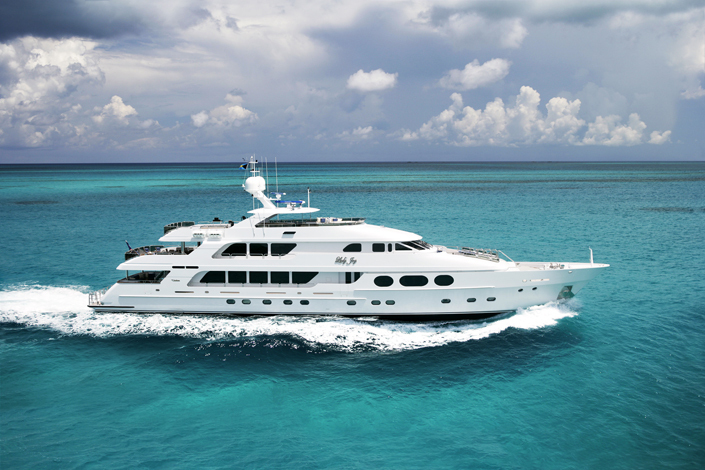 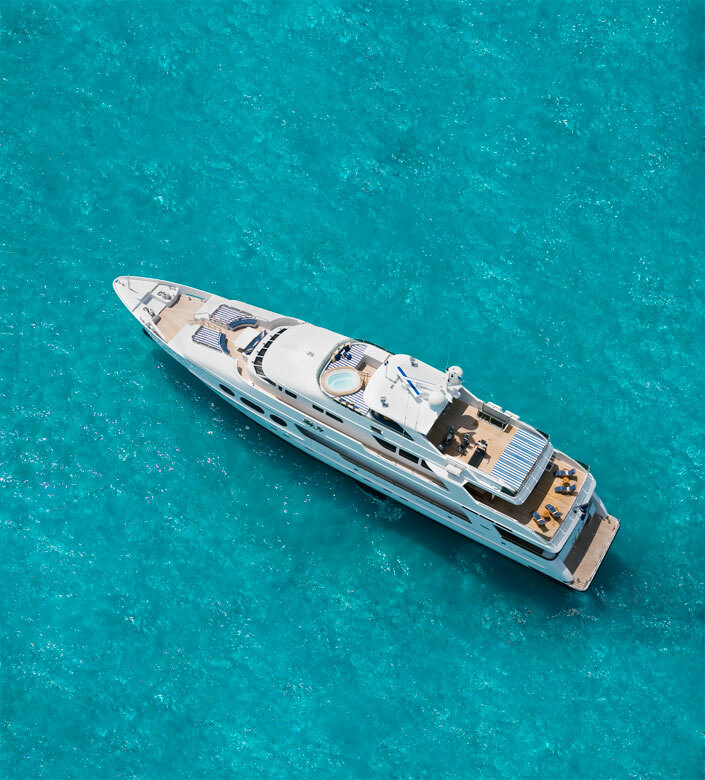 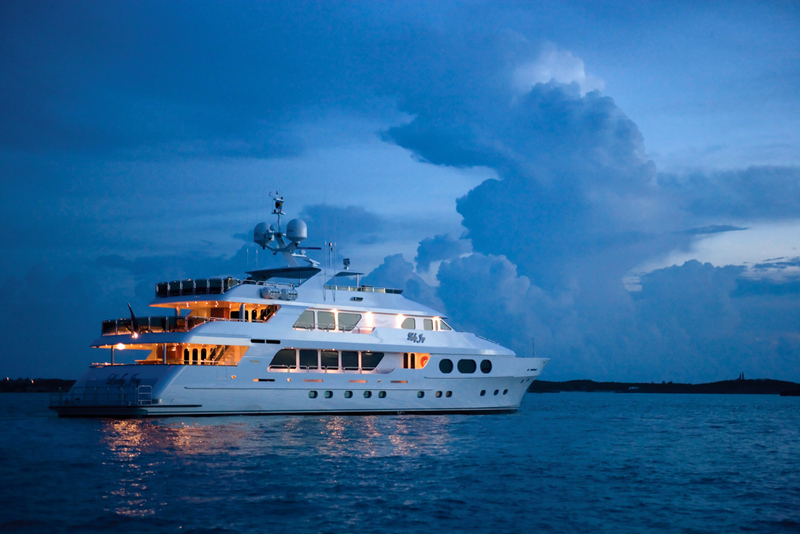 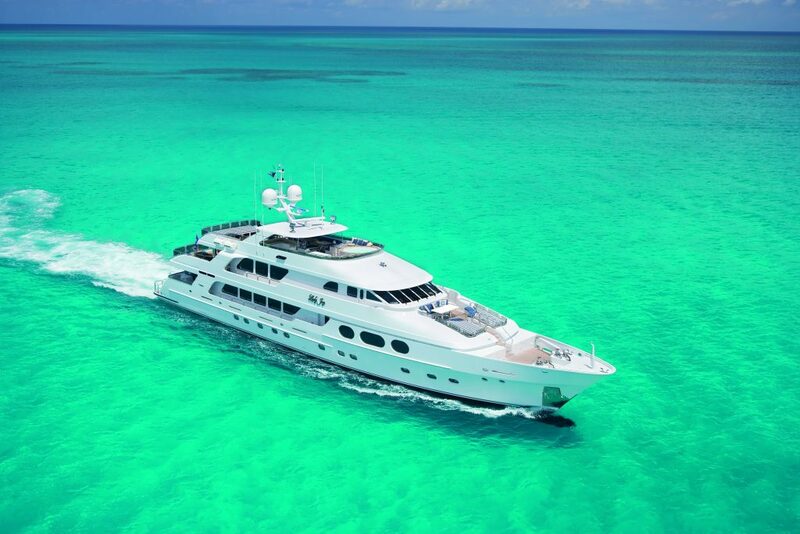 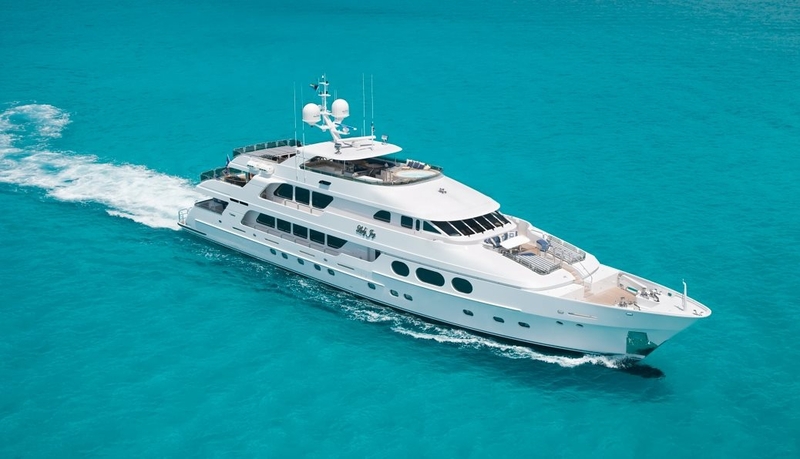 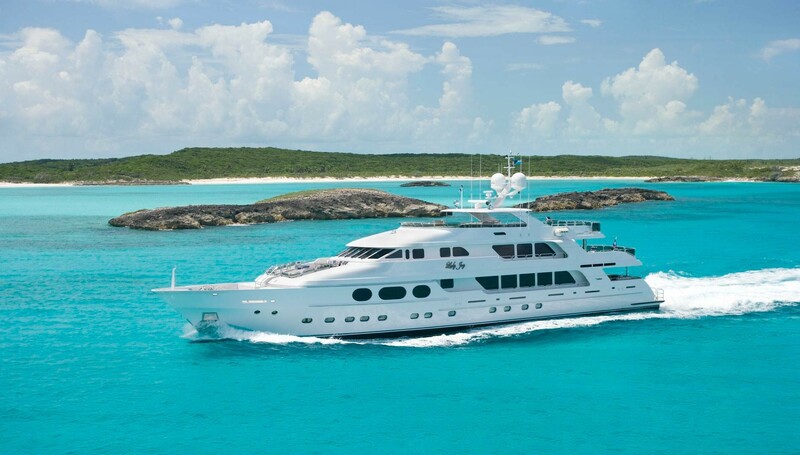 Built by Christensen Yachts, she is the epitome of refined style and five-star luxury. 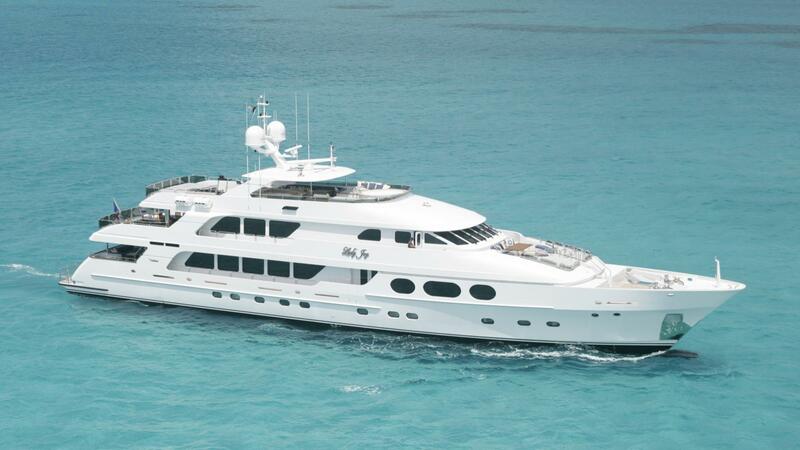 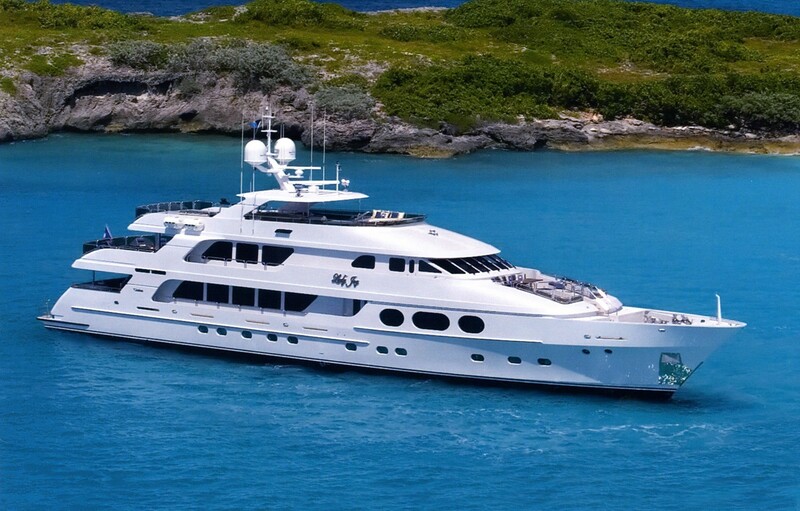 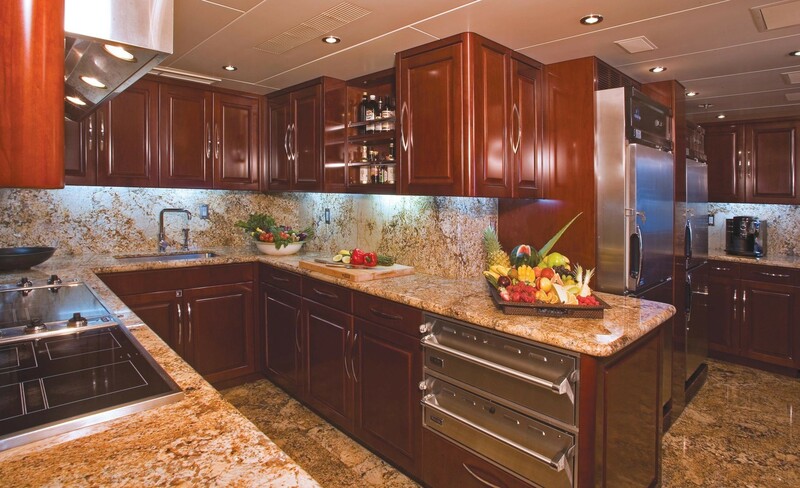 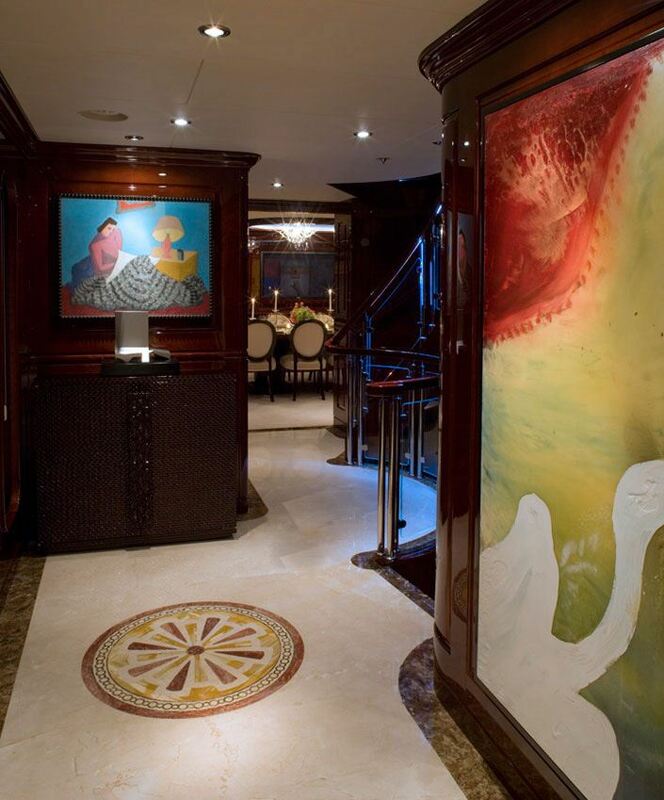 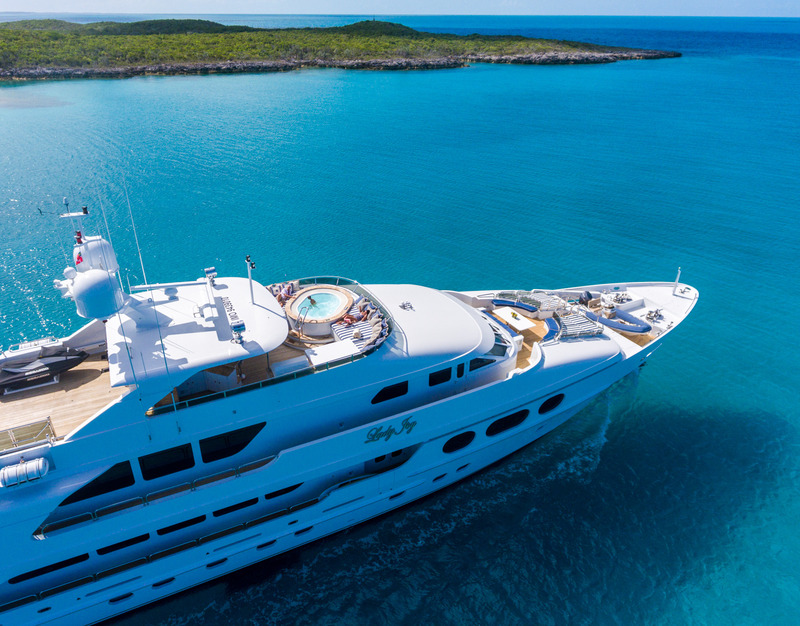 M/Y Lady Joy features state of the art and modern touches including an elevator service to all of her decks. 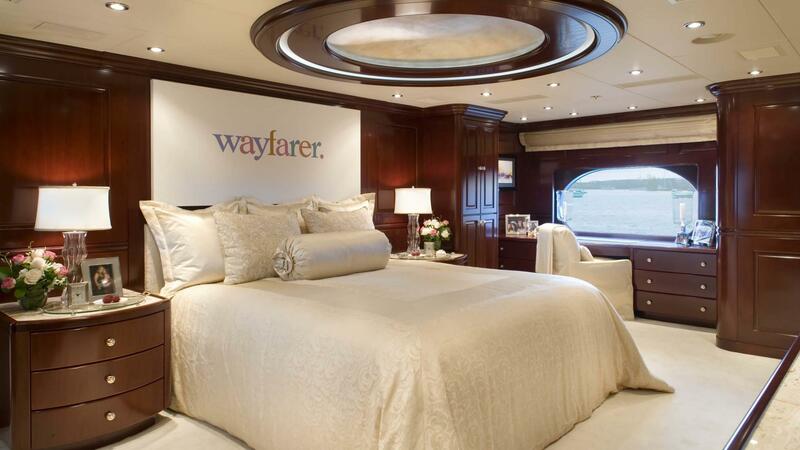 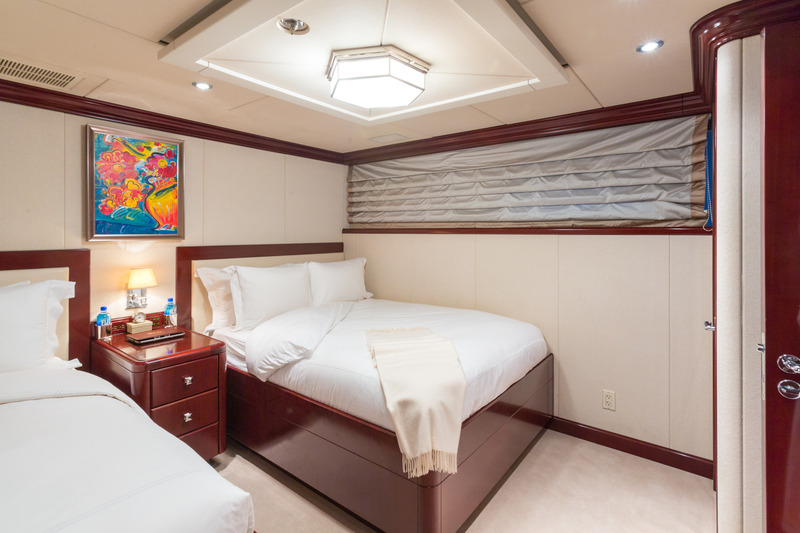 There are three large decks as well as six staterooms with en-suite bathrooms. 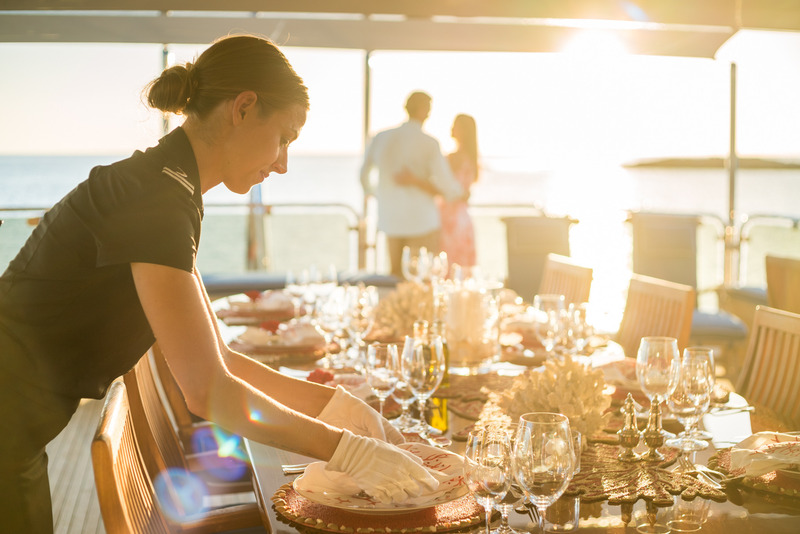 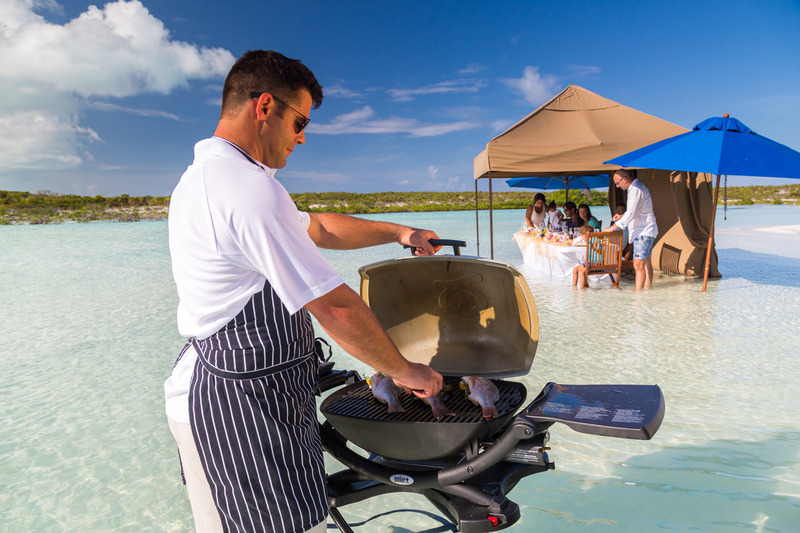 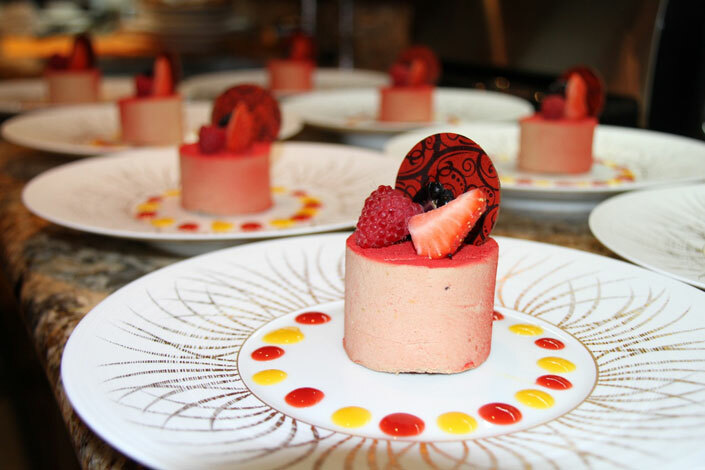 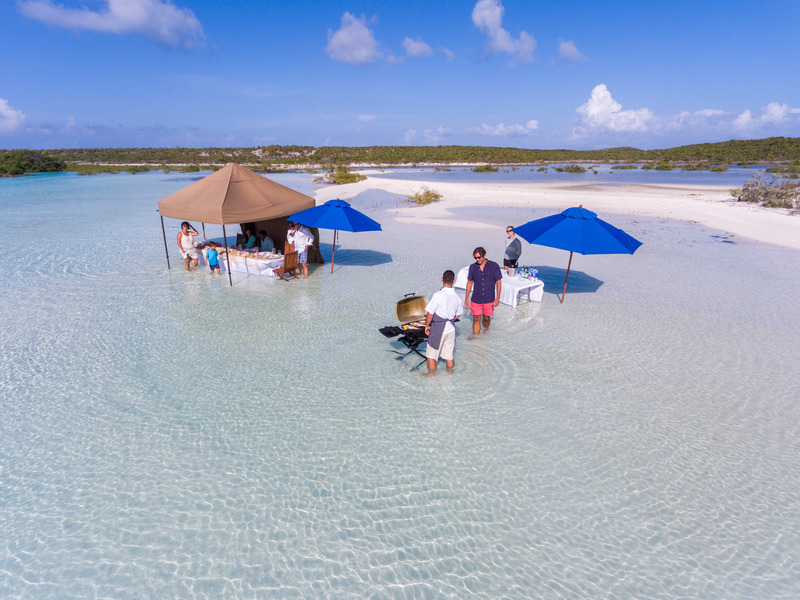 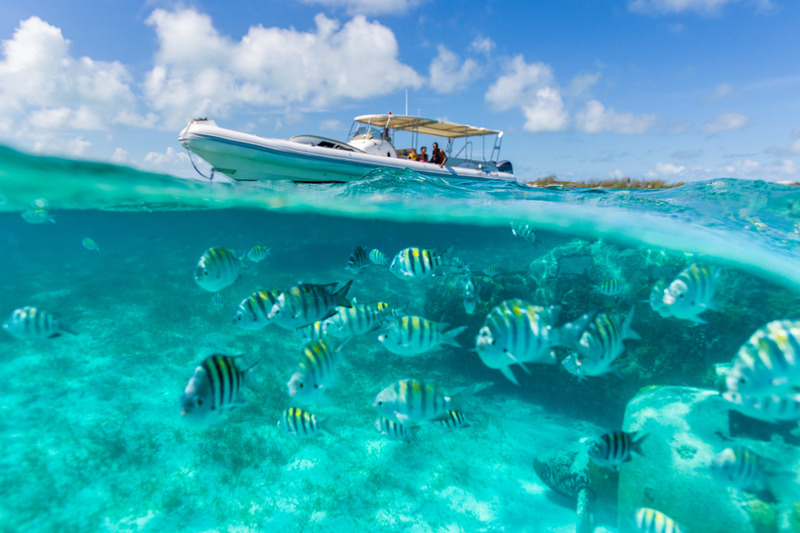 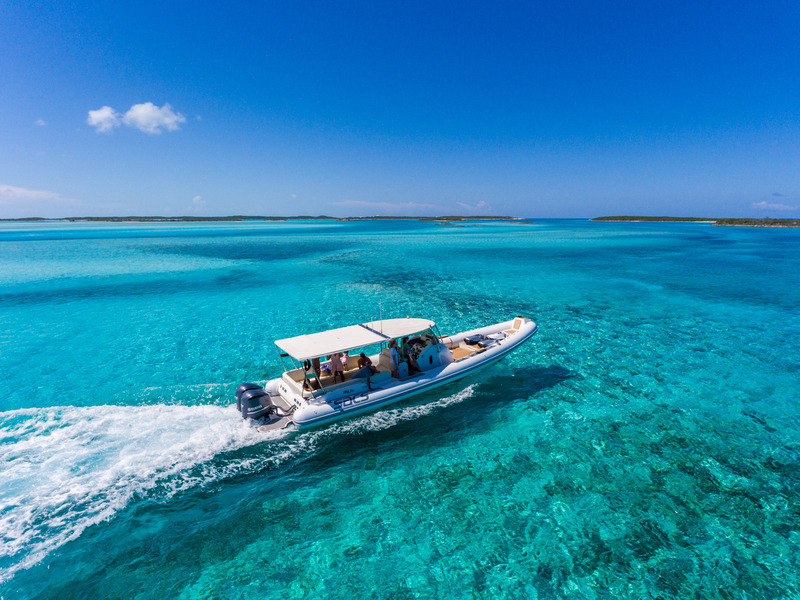 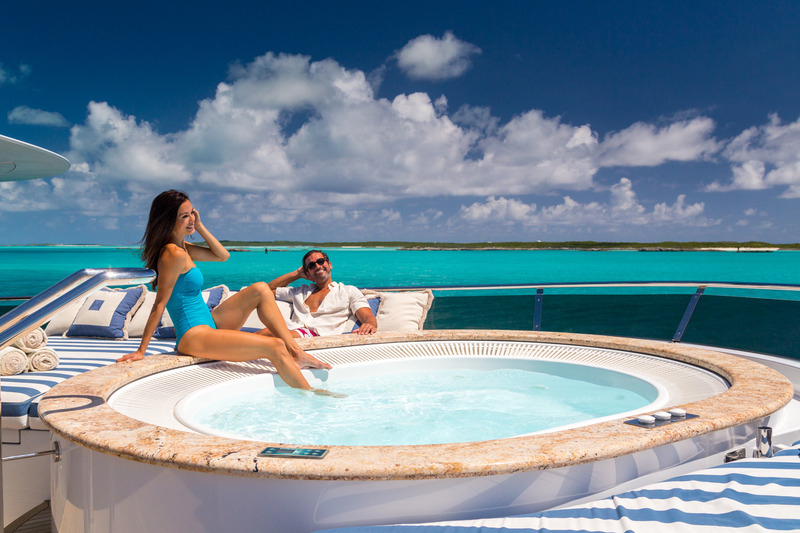 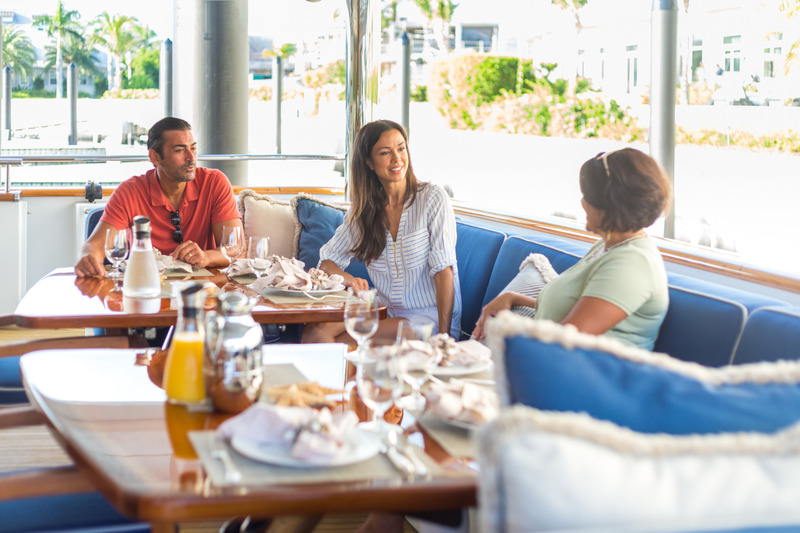 She has numerous areas throughout the vessel to entertain, dine and relax while her professional and friendly staff takes care of your every whim. 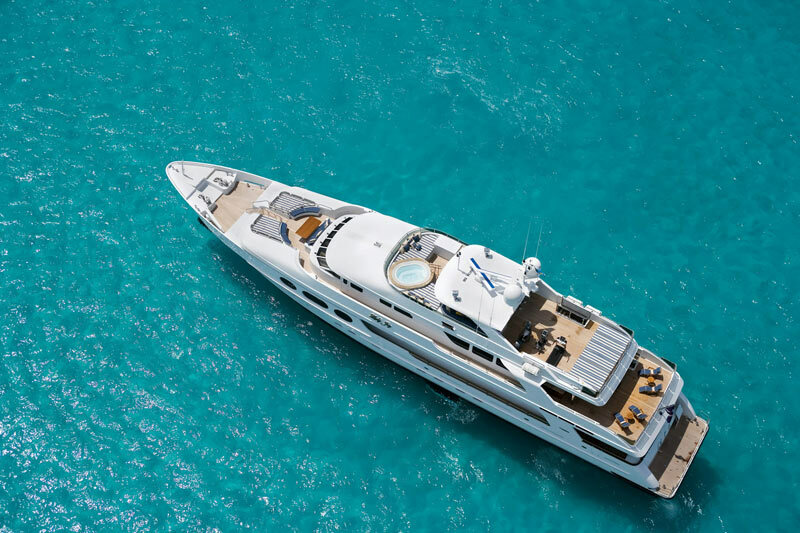 There is a Spa Pool forward and large cushioned sun pad as well as a BBQ grill, bar with stools and adjacent banquette for casual dining for 12. 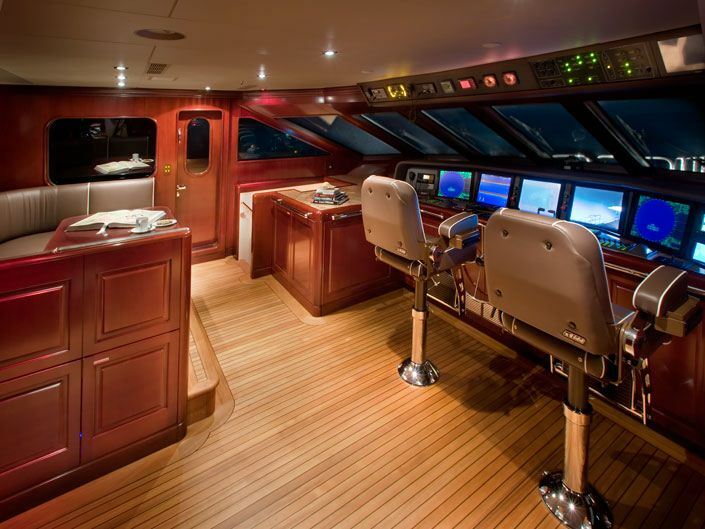 The spacious aft deck carries the water sports equipment. 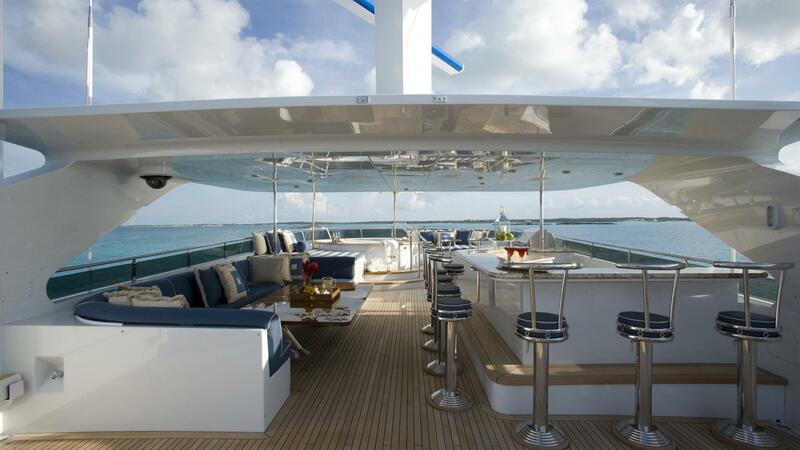 On the sun deck, the clever design of the super structure provides shade at the bar and dining area. 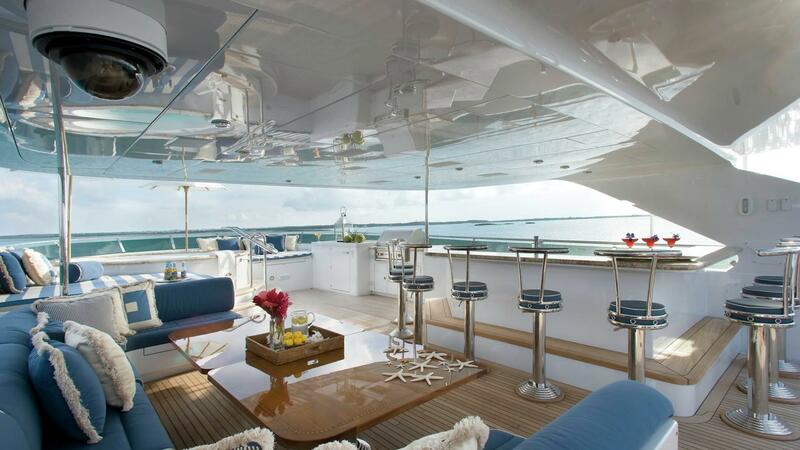 Lady Joy’s Bridge Deck offers a spacious sky lounge with bar, cocktail/game table, and conversation area. 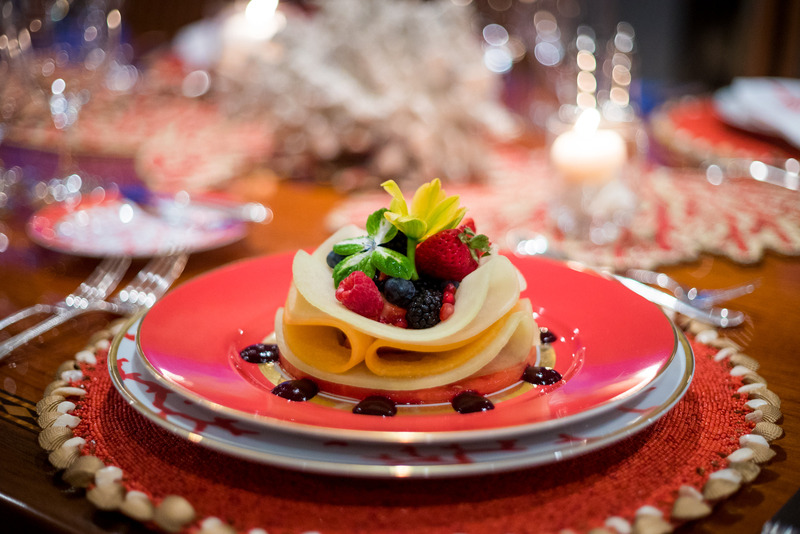 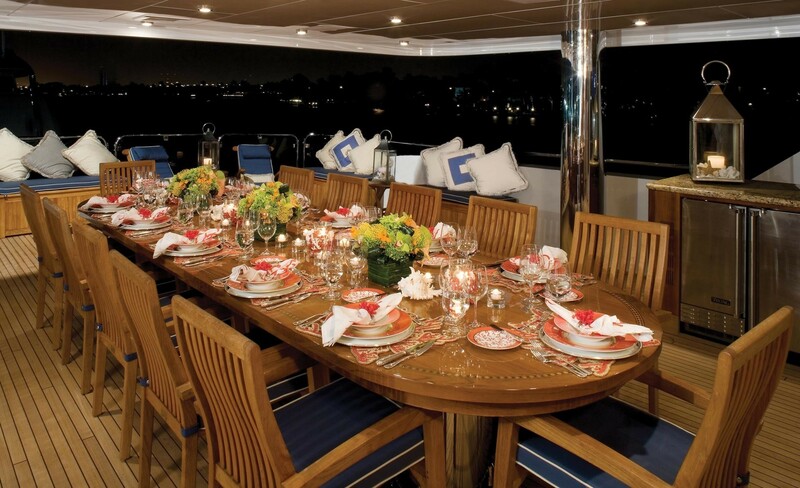 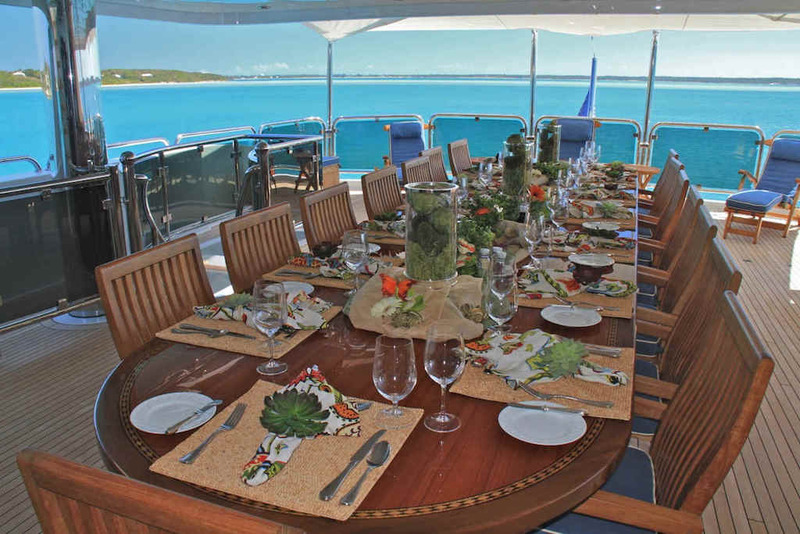 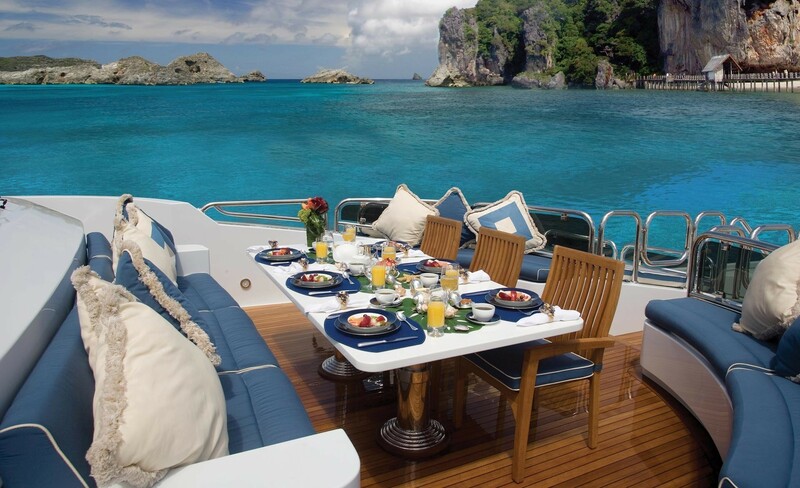 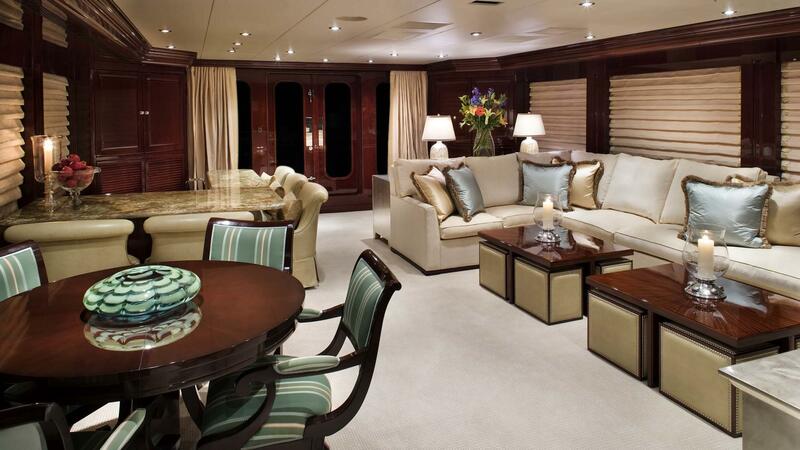 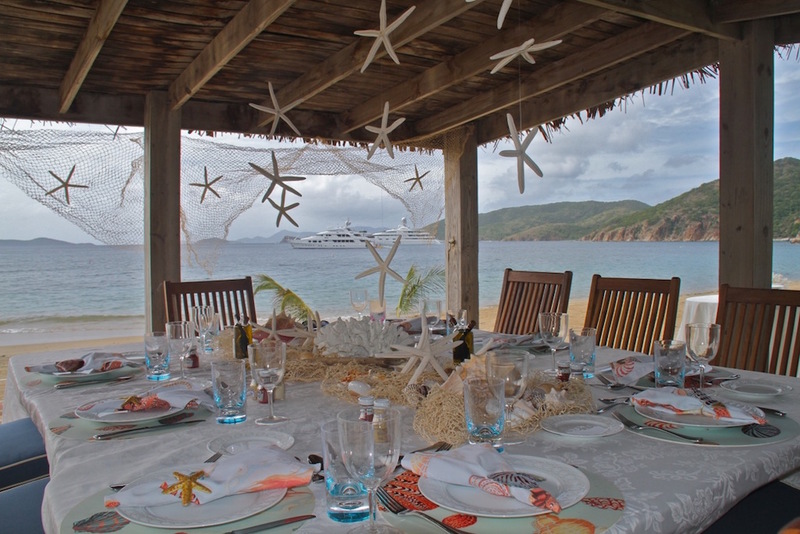 On the yacht's aft bridge deck, there is covered dining for 12 guests and room for lounge chairs on the open deck. 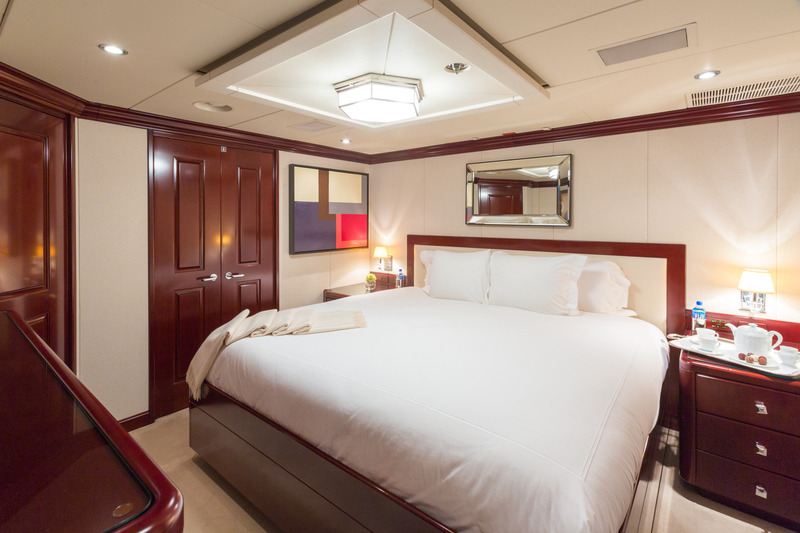 Accommodation layout includes the master cabin with walk in robes, his and her bathrooms and a private office. 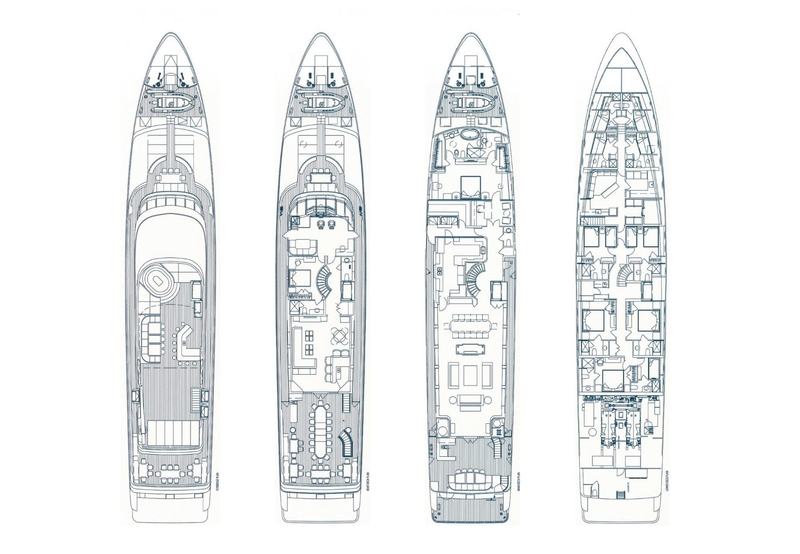 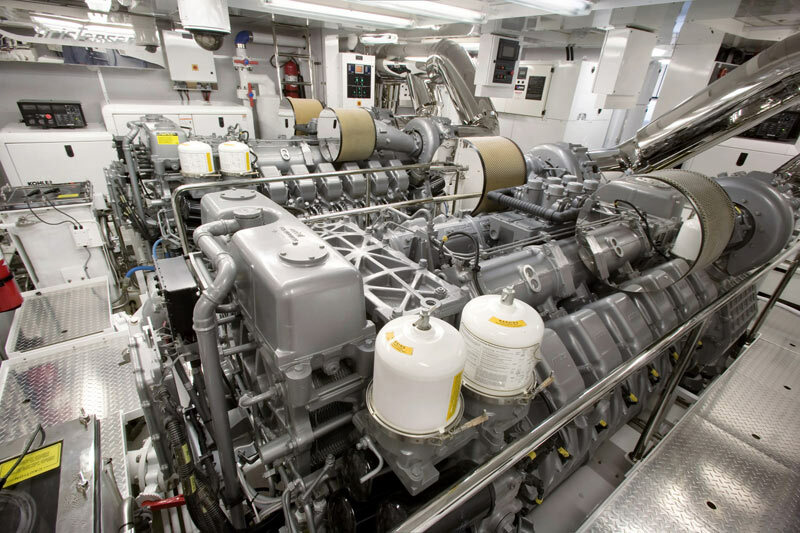 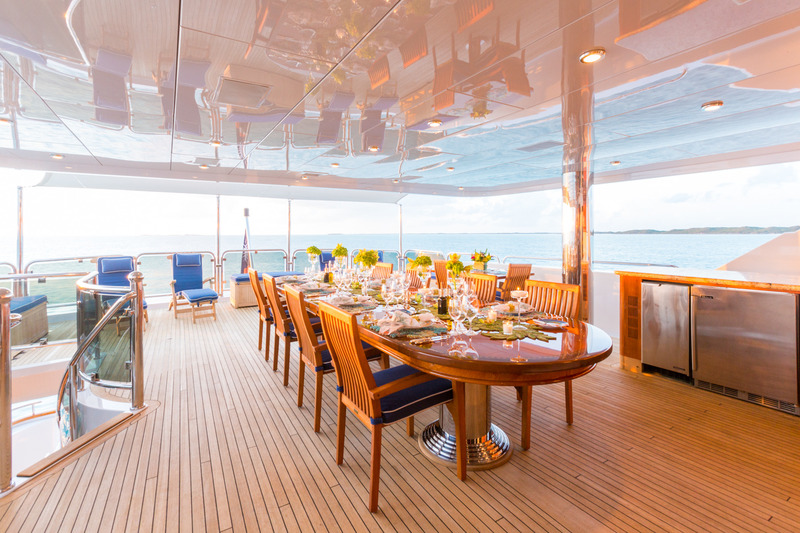 The Main Deck also has a powder room, formal dining room and a salon, all with large windows that let in plenty of natural light and offer excellent views from the seating area. 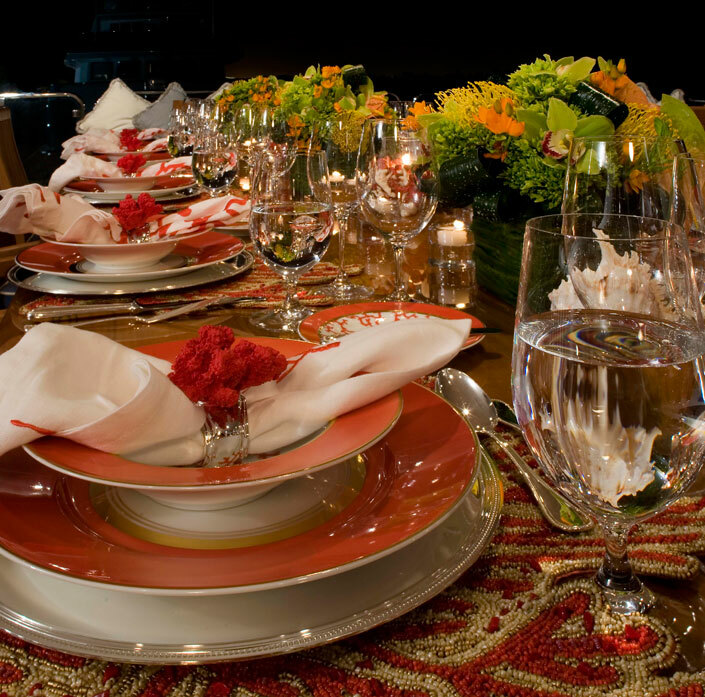 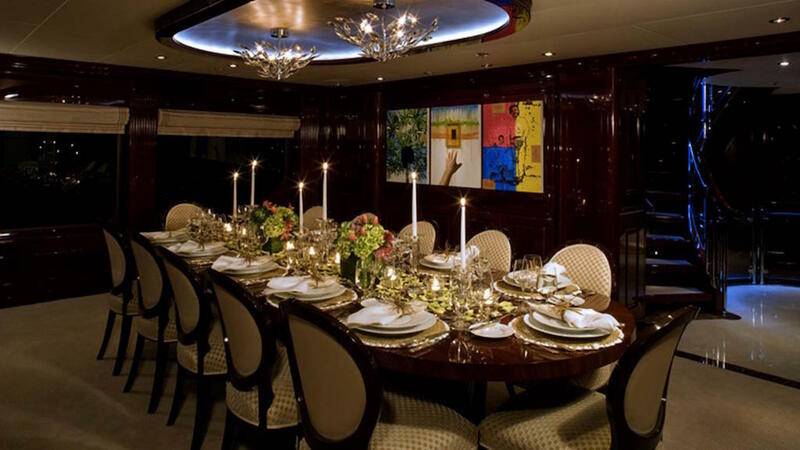 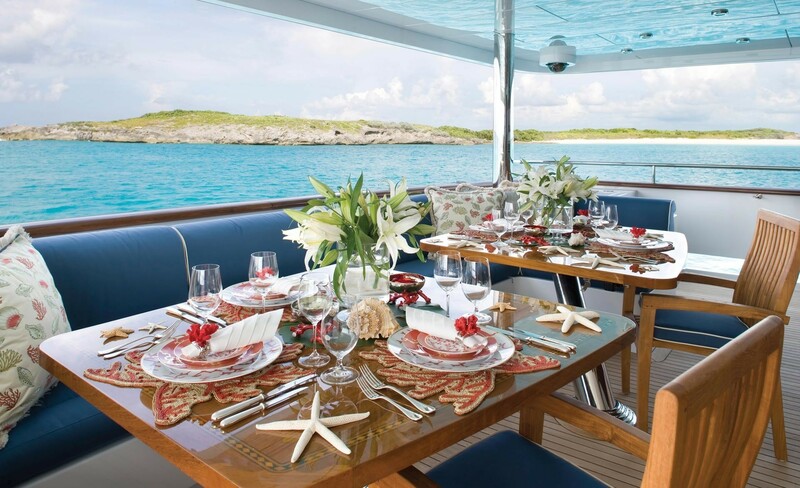 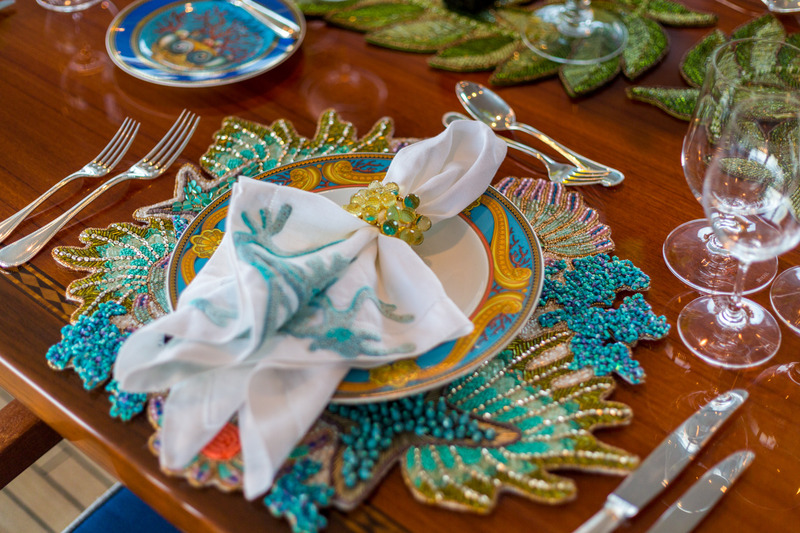 The yacht's dining area has a large table with seating for 12 guests. 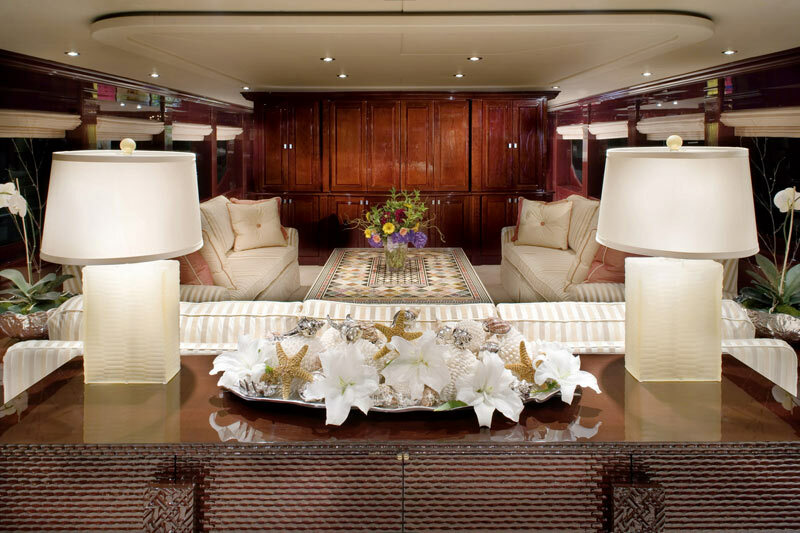 Providing semi privacy between the salon and the dining area is a center credenza. 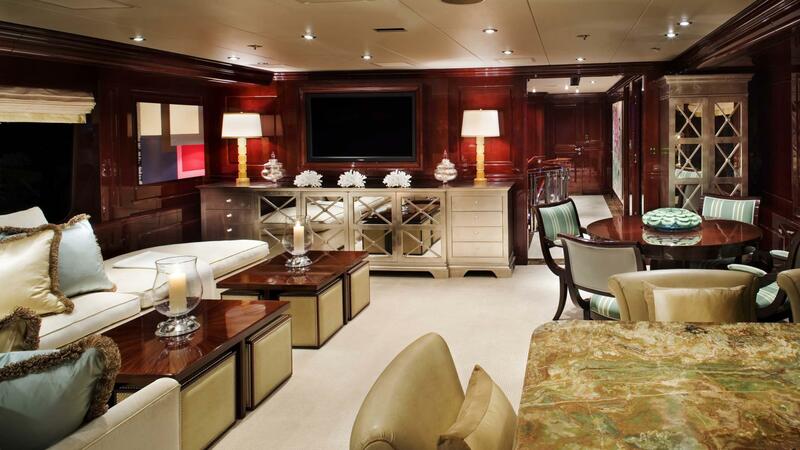 The main salon is spacious with plush seating and a conversational area as well as a full entertainment center including a wide screen television. 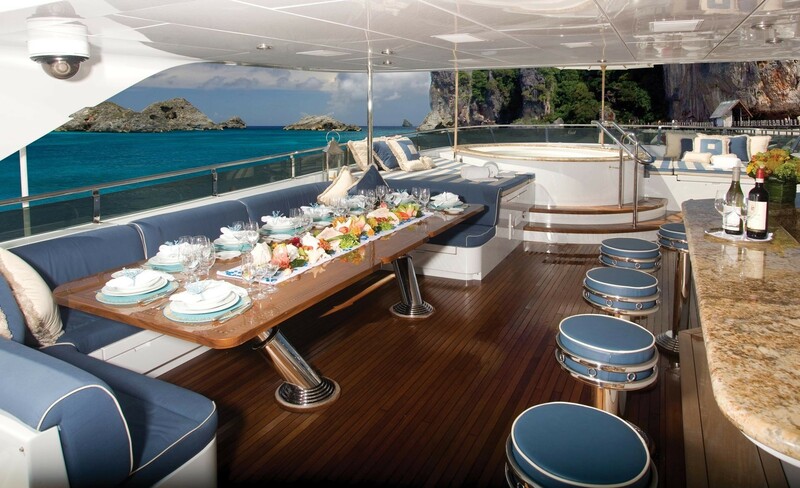 Forward of the bridge is more exterior seating and a table. 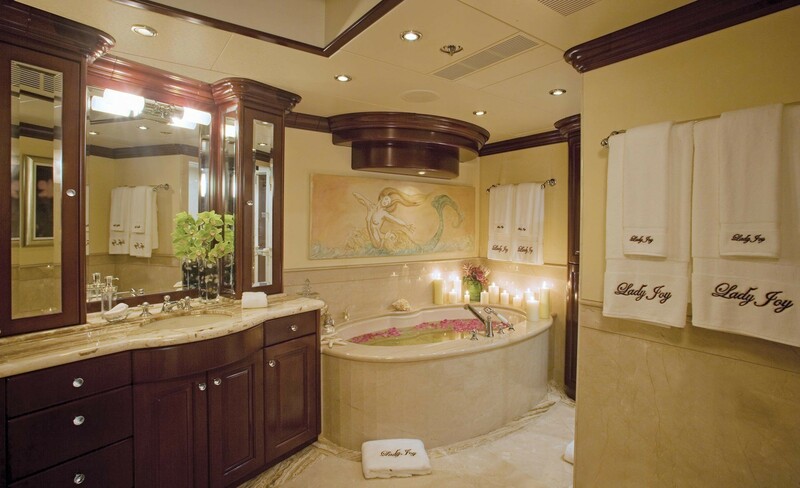 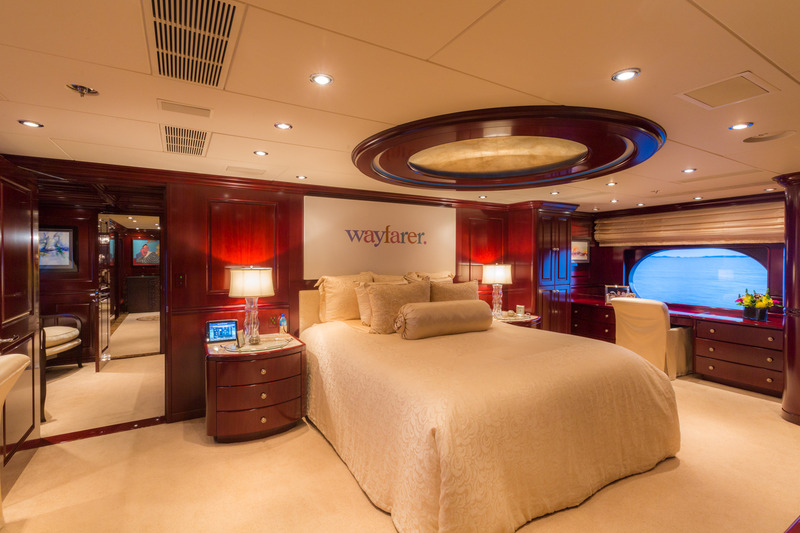 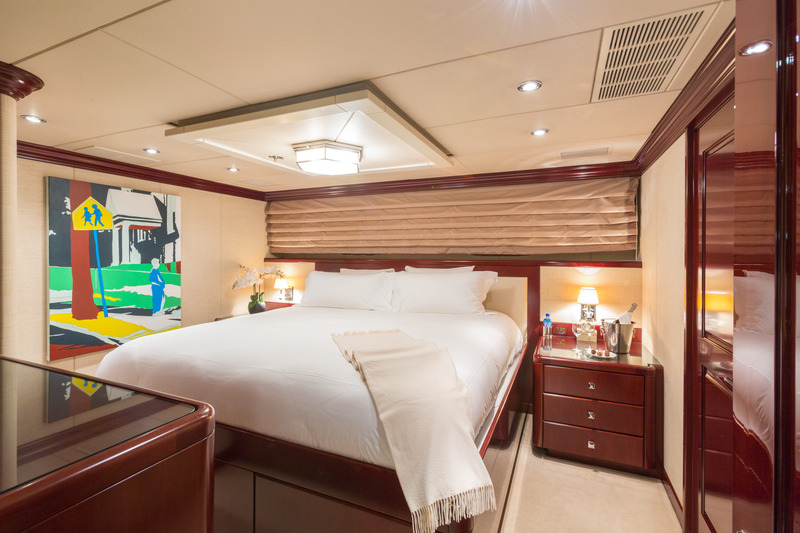 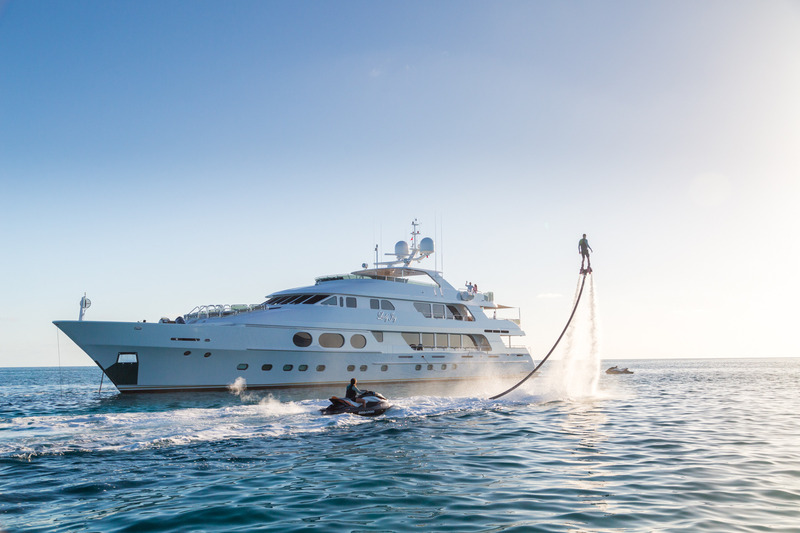 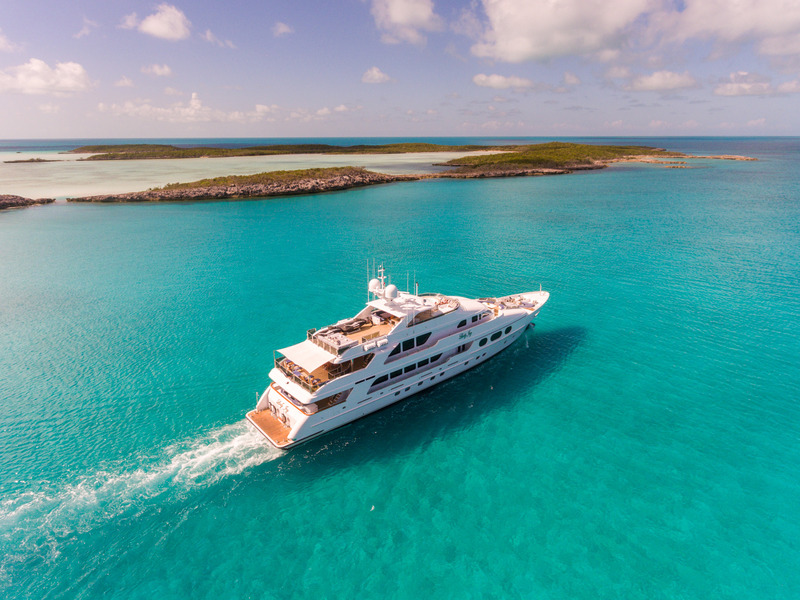 Motor Yacht Lady Joy has six staterooms including a master suite with walk in robes, his and her bathrooms as well as a private office located on the main deck. 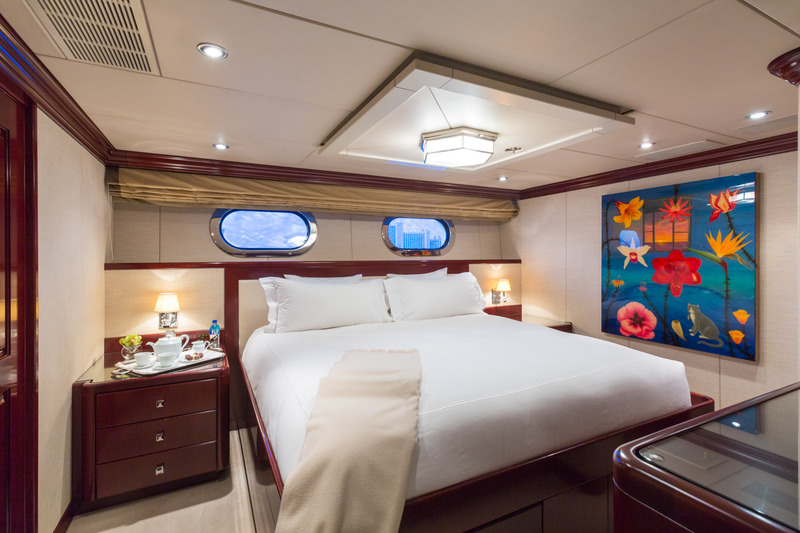 The five remaining staterooms are below deck and include a VIP king with a spacious bathroom, two guest kings, which are equal in size and two guest twins with a double bed and a twin Pullman with en-suite bathrooms. 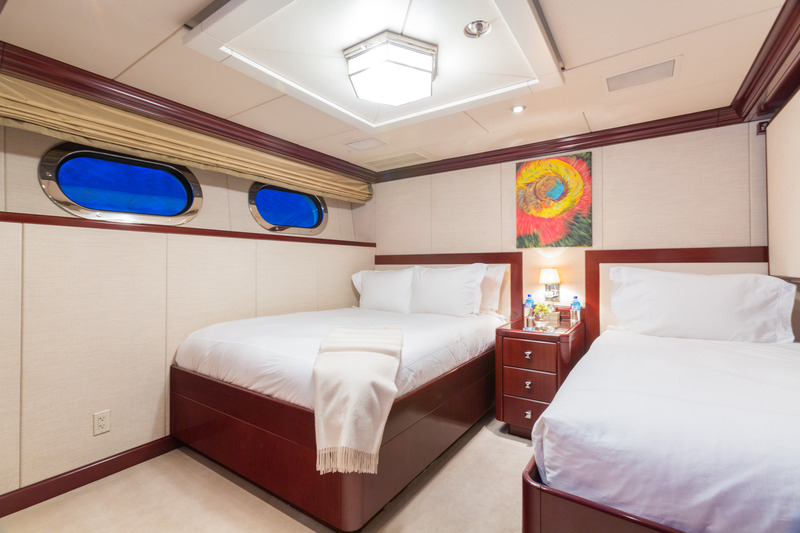 There is also a cabin with single bunk beds and a full-size bathroom with is perfect for children or a nanny. 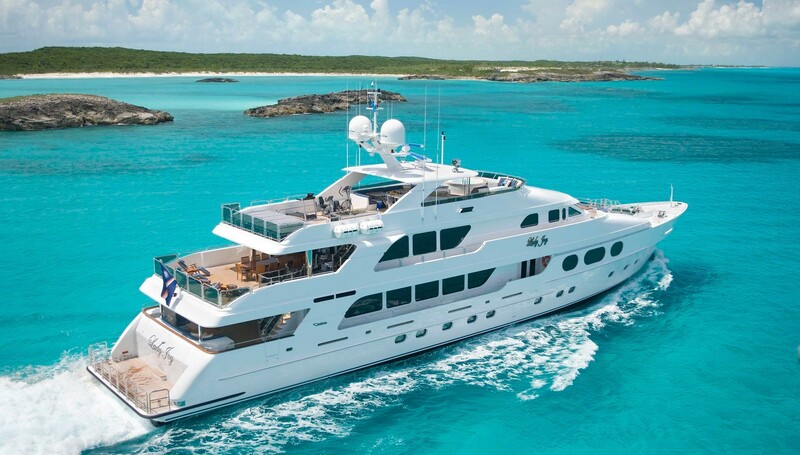 Luxury yacht Lady Joy services all of her decks with an elevator as well as stairs between decks. 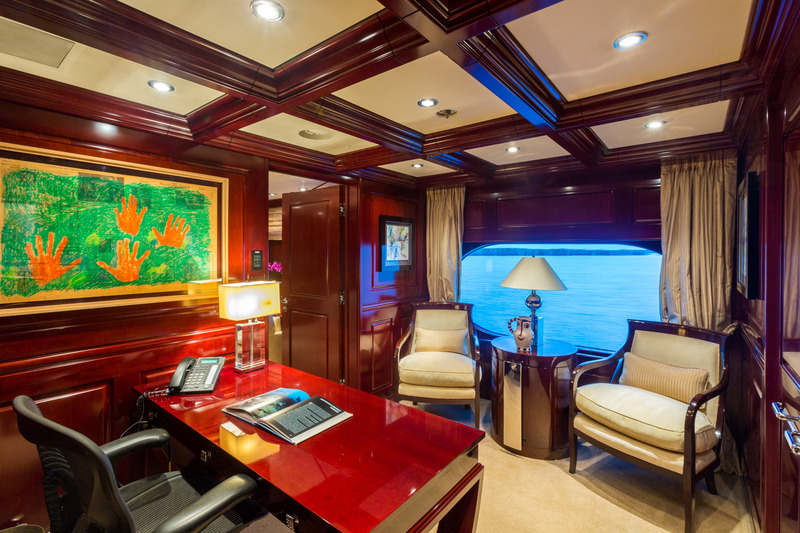 All of the state rooms have flat screen satellite TV, Crestrom Controllers and remote access to the central entertainment system for music and videos. 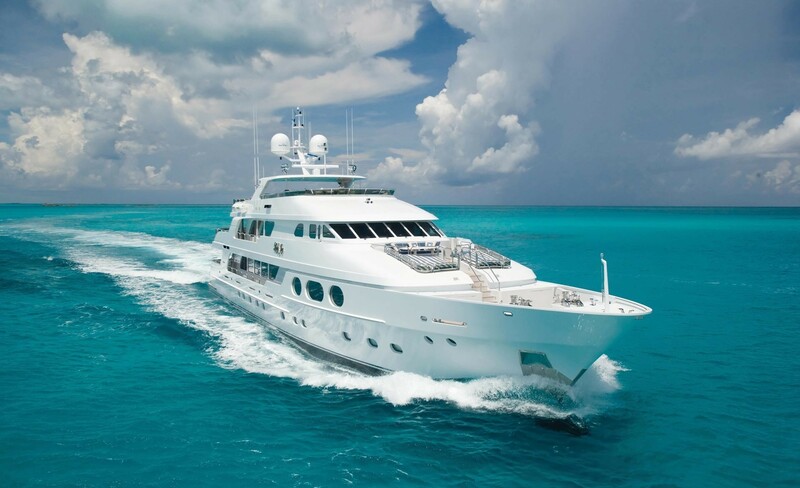 She has VSAT communications and internet access is available 24/7 wirelessly throughout the vessel. 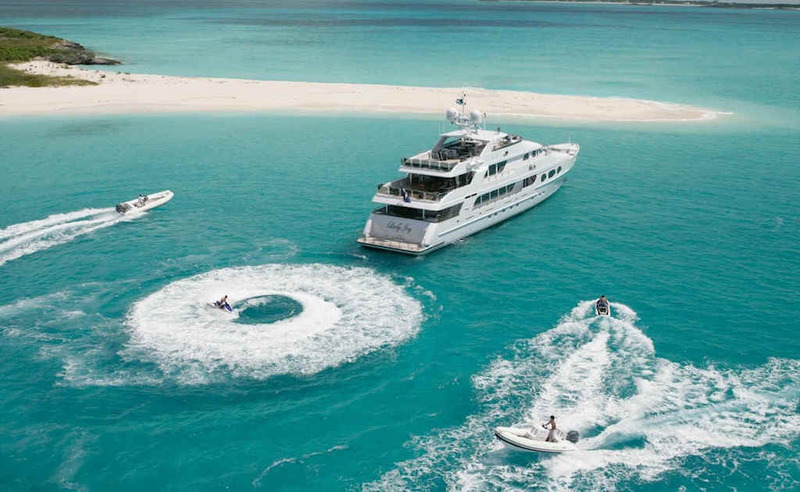 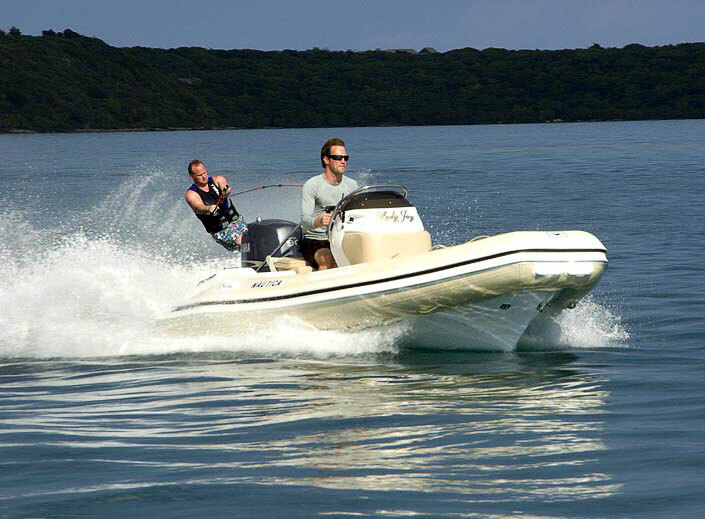 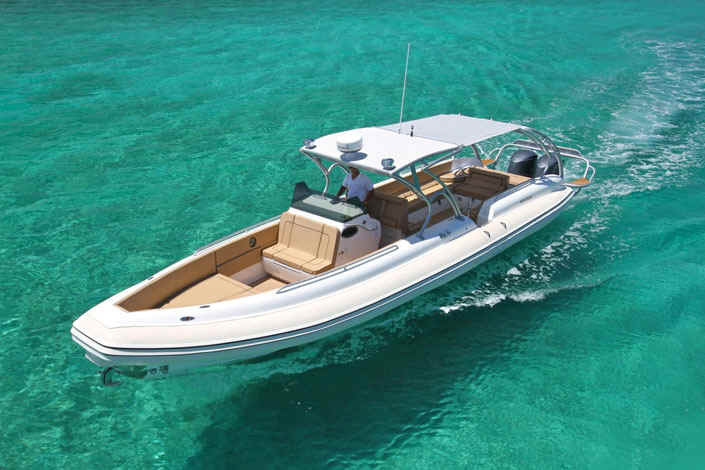 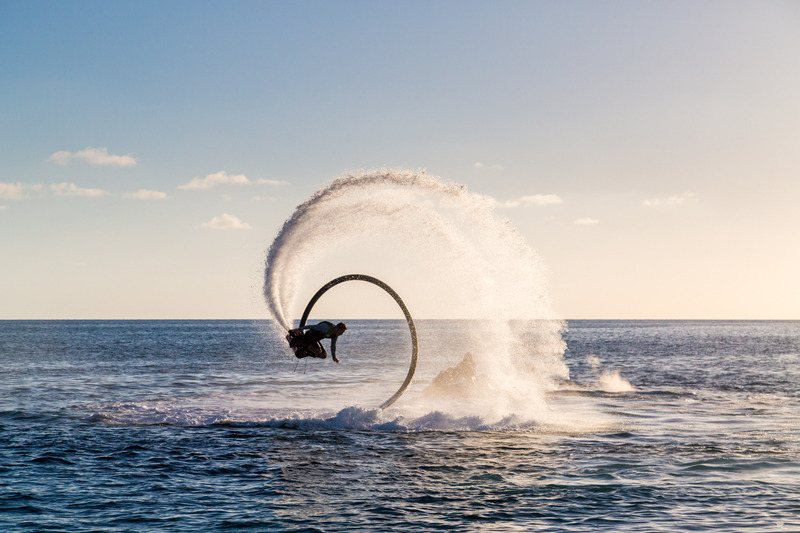 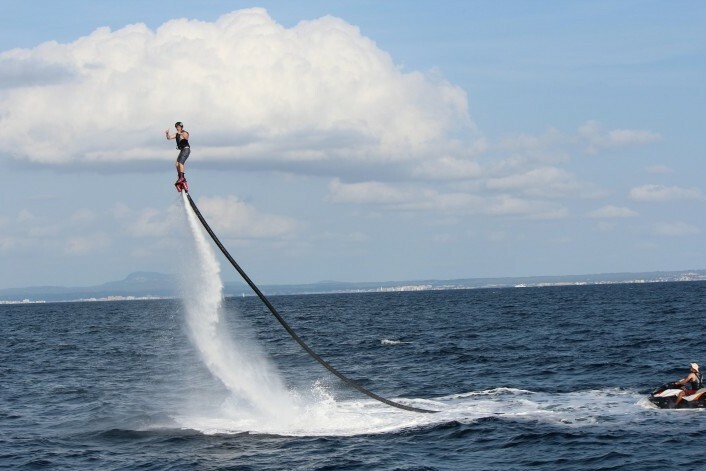 Lady Joy’s water toys include a 22ft Nautica Widebody with twin 115 HP Yamahas, a 17ft Nautica, two 4 stroke Waverunners, two Vespa Scooters as well as snorkel and SCUBA gear. 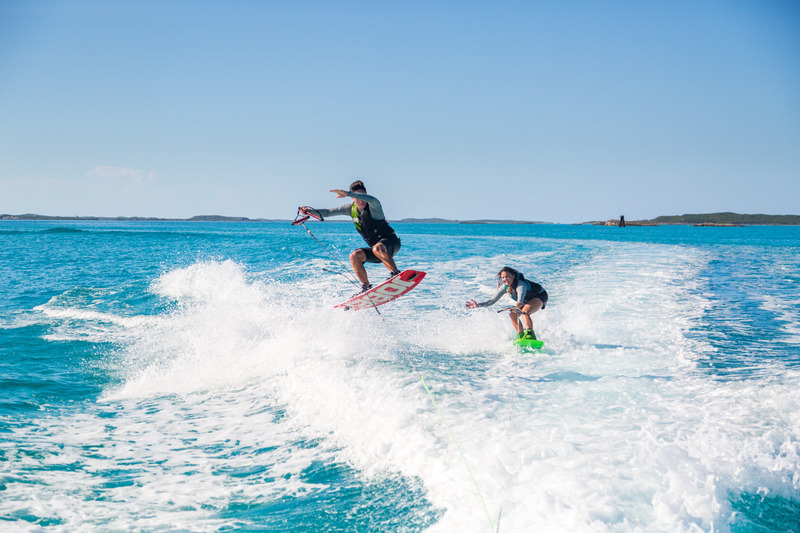 Exercise equipment including a stationary bike, elliptical machine and treadmill is also available to guests wishing to exercise during the vacation.